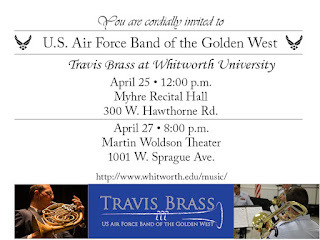 The symphony will play with Travis Brass, a quintet consisting of two trumpets, a horn, a trombone and a tuba. Travis Brass is based at Travis Air Force Base in California and tours throughout California, Oregon, Washington, Nevada and Arizona supporting troops and honoring veterans. In addition to supporting military ceremonies and presenting free concerts, Travis Brass members invest much of their time educating future musicians. The group offers intensive coaching sessions for all ages including collegiate undergraduate and graduate students. “Working with students is one of the most gratifying and important facets of my job as an airman-musician,” says Tech. Sgt. Tom Salyers, the noncommissioned officer in charge of Travis Brass. “We are able to encourage young musicians in their craft and inspire the next generation of American airmen.” For more information, visit the USAF Band of the Golden West website: www.bandofthegoldenwest.af.mil. The Travis Brass will also perform a free concert for the public on Wednesday, April 25, at noon at Whitworth University in the Myhre Recital Hall.